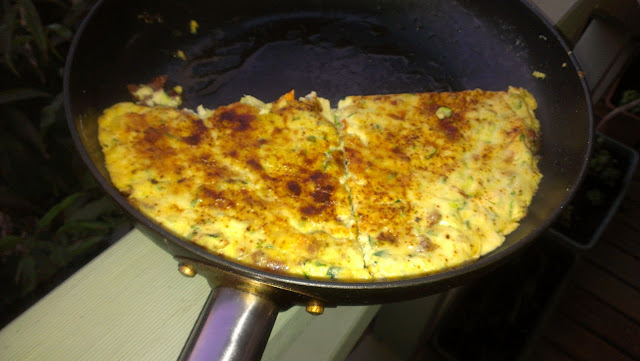 I don't know about you, but one of my comfort foods is fritatta. 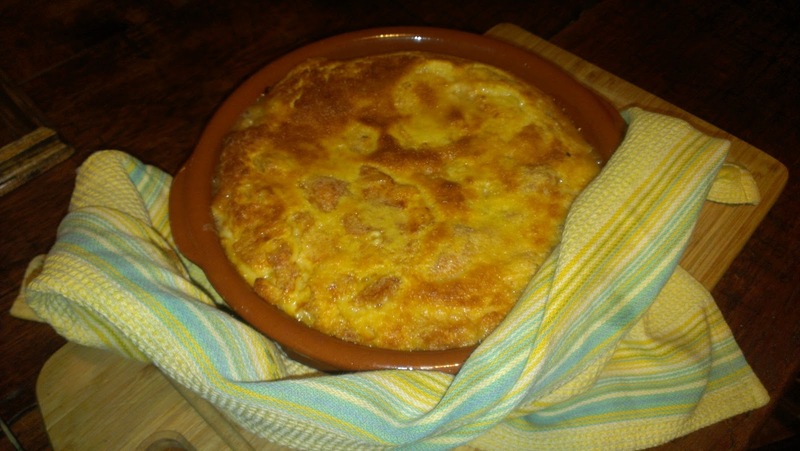 It's a relationship that started when I first went to Spain where fritatta is a staple. Here is tonight's Zucchini and Chorizo Fritatta, inspired by the flavours of this Spanish staple. 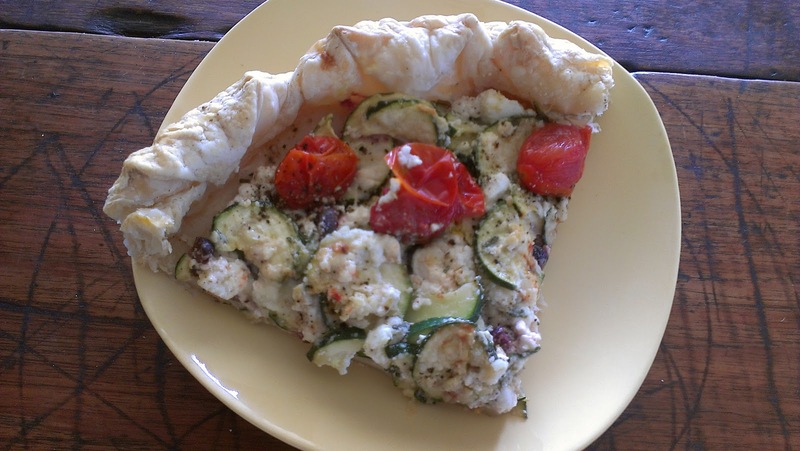 In one bowl, mix zucchini, ricotta, semi-dried tomatoes. In a frying pan, lightly fry the garlic, onion and chorizo. In another bowl, whip eggs and pour into zucchini mix. When onion, garlic and chorizo mix is cooked on, lower the heat and pour in the egg, ricotta, onion and garlic mix. Sprinkle with chipotle and parmesan cheese. Cook on stove top until cooked at least half way through, then place frying pan under the grill to cook from the top until cooked through. Cut fritatta and serve and eat. Yum! I am afraid to say that all my photos of cooked food look horrible, but believe me, this was delicious. 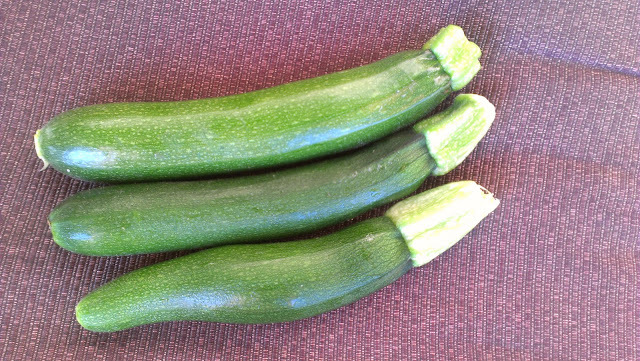 My two zucchini plants are still producing and I an enjoying the produce and picking quite young. 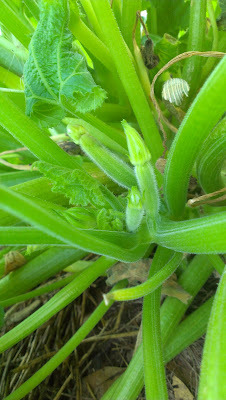 I am looking forward to a few more zucchini feeds this autumn before the frost nips the plants. How are your zucchinis? What have you made recently with your zukes? 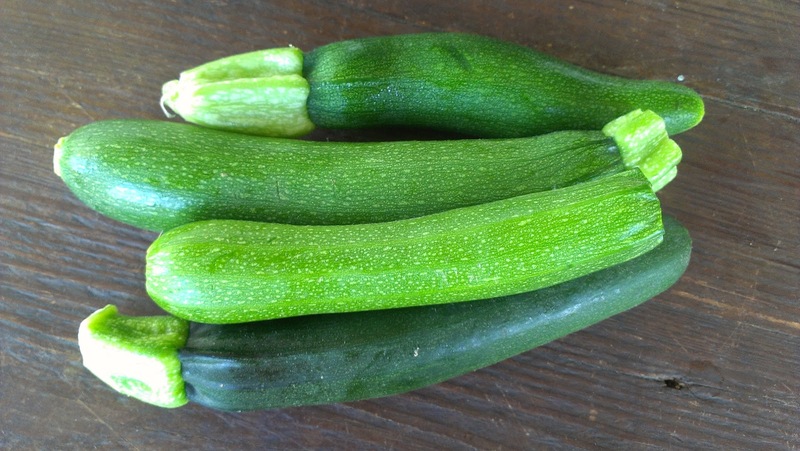 Until next week - Love your zucchini. 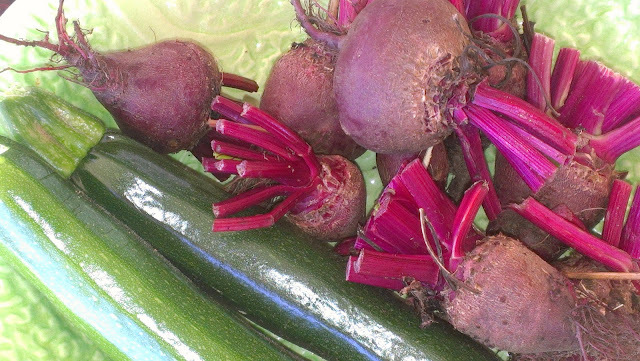 The beetroot that were grazed off by the Wallaby earlier in the season have managed despite their mauling to survive and their roots are now thickening. 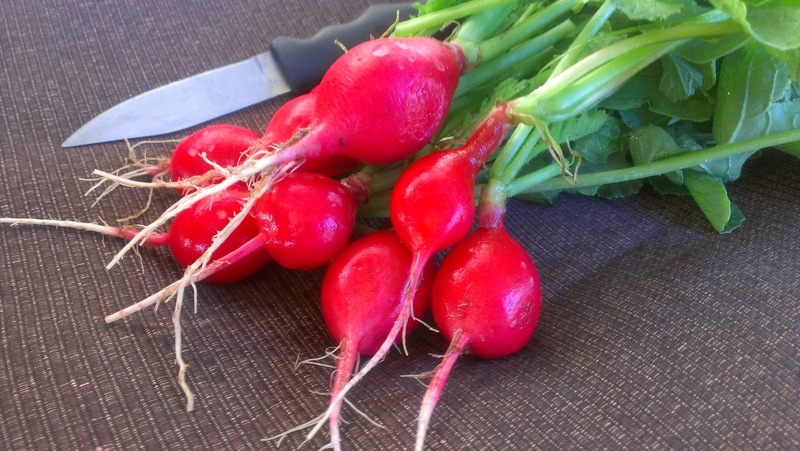 This last week I decided to pick a few - they are small but I always deliberately over plant beetroot and use the first pickings to thin the crop. As time goes on the roots will become bigger as more space is made for others. 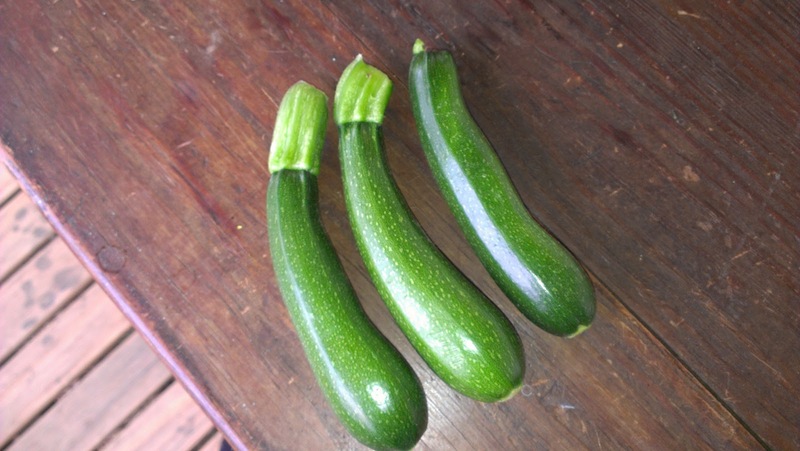 I have also been picking zucchinis determined to get most from this crop before the frost shuts it down. loads of rocket, some radish, herbs and some chillies which are getting strung up to dry. 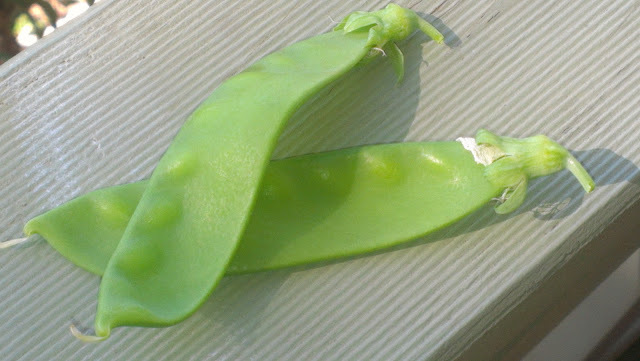 and the first four snow peas, only two pictured here as I quickly ate the other two - they often don't make it inside. I am contributing this to Daphne's Harvest Monday. My harvest is pretty meagre for this time of the year for Southerners. I am sure that others who occupy this half of the globe will have much more produce to show you. The peach glut continues to be overwhelming. Each day I collect a large basket full of peaches, each day I ponder what else to make, each day the crimson rozellas are allowed to eat their fill. Despite already having a big stash of jam - apricot and strawberry - I decided that one of the most efficient ways of dealing with the glut is thru more jam making. Here is my recipe. Place all ingredients in a large pan and cook making sure it doesn't catch on the bottom. When the jam has thickened and set poor into sterilised jars and cap while still hot. This quantity yielded 5 jars. Groaning under the volume of jam, some jars are heading their way to friends in Sydney. I am contributing this to VG's Thursday Garden Gobbles. See what others have been making with their produce. The days are getting cooler so enough of zucchinis in salads, its time to cook. 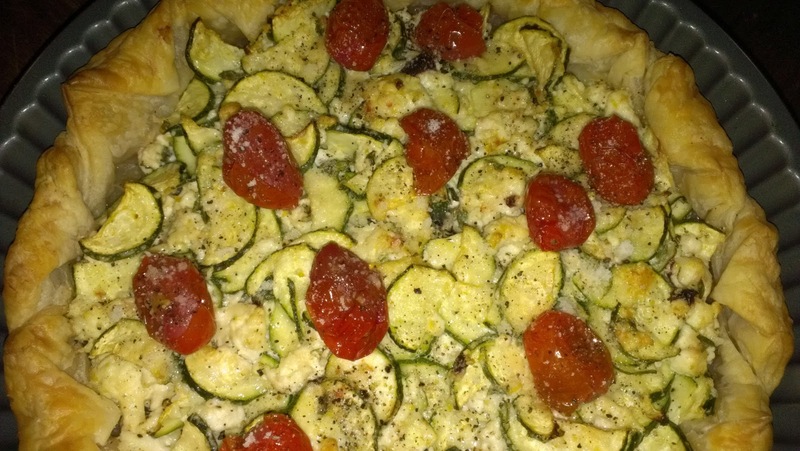 Earlier this week I decided on a light zucchini tart. This recipe is adapted from one I found years ago in a Gourmet Traveller. I don't know which issue as I cut the recipe out. Line a lose bottomed fluted tart tin with puff pastry (I used 3 sheets of frozen pastry overlapping) and blind bake in the oven at 200c. Combine zucchini, feta, thyme, garlic and lemon rind in a bowl, season with black pepper. Spoon into pastry case, lightly sprinkle top with parmesan and bake until the mix becomes golden. Roast tomatoes in the oven marinated in red wine vinegar and olive oil. Remove tart from the tin carefully. Place tomatoes on the top of the tart. Eat. I think you could do endless varieties of this recipe, indeed this is already an adaptation of the original which used dill instead of thyme and I added parmesan and olives. Our bird baths are a constant source of activity and amusement. Here are some of the bathing beauties that visit. 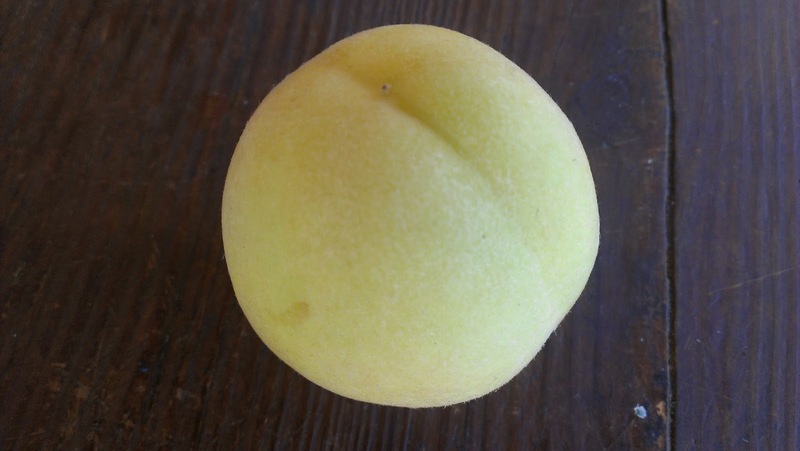 Thursday Garden Gobbles - Peaches again! The peaches are falling like... peaches. As I type the soft thud of a falling peach can be heard in the background as yet another topples to the ground, and its not even windy. 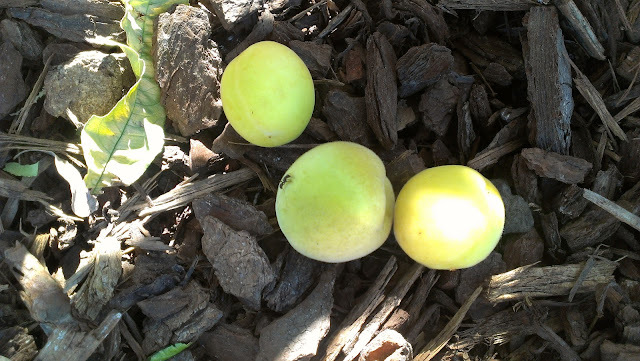 I know they don't look ripe, but this peach tree produces green tinged yellow fruit which is white inside. I have so many peaches and I have made so many peachy things already. 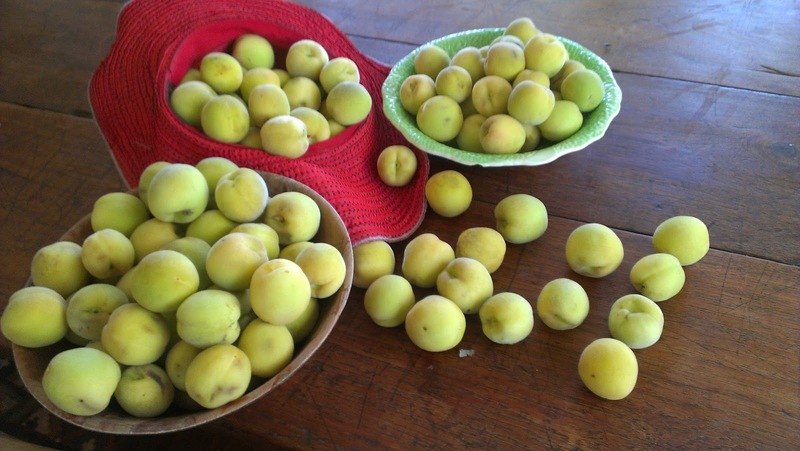 Peach chutney, peach pies, loads of stewed peaches in the freezer and I have no more room. I have made salads with peaches and eaten loads fresh. 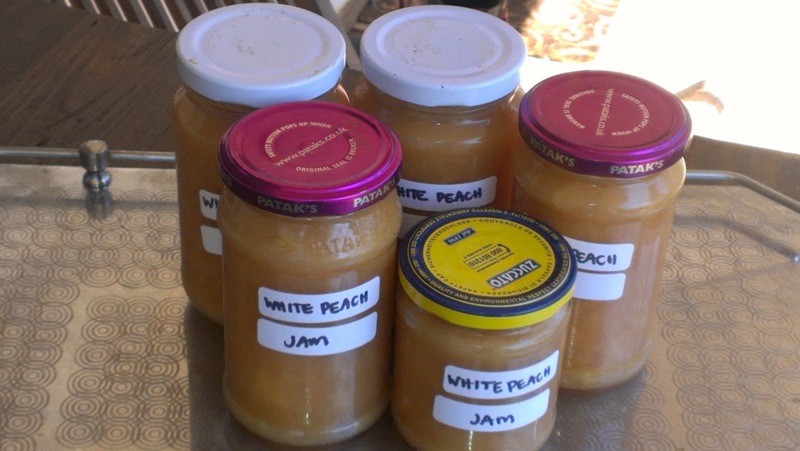 I have years worth of jams in the cupboard - strawberry and apricot and others I have picked up at community stalls, I don't need any more jam of any sort. Now what to do? I can't give them away as neighbours are groaning under their own fruit gluts and I don't yet have chookies. I am also not actively defending the peaches from others who like to eat them. The wallabies are eating as many as they want by night, sucking the stones clean and adding to the mulch. And the crimson rozellas are free to sample. Desert, yes desert. Anyone who knows me knows I don't have a big sweet tooth and I rarely contemplate desert, but there is a peach emergency and something has to be done, so desert is it - peach clafoutis. This is the image I sent to ABC Riverina's Gardening Talk-back in order to try to identify the pale variety - they couldn't help. They said it looks like a moon. Pretty isn't it? Prepare peaches and toss in sugar and reserve. Lightly grease a baking dish and place the fruit and sugar mix in the bottom of the dish. Place all ingredients except the peaches and the sugar in a blender and blend. Pour over the fruit. Bake in a 180c oven until golden brown. Eat. Looks good doesn't it? But in fact is was a bit loose. I followed a recipe exactly... it might have been loose because the fruit was very juicy (even though I drained it and drank the peach nectar - yum) or because the batter was too moist. If I were to make this again with the same fruit, then I would use only 1/2 cup of milk. Was it yummy? Yes. 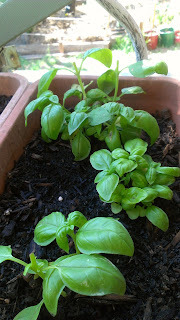 I am contributing this post to VG's Thursday Garden Gobbles, see what bounty others are cooking. 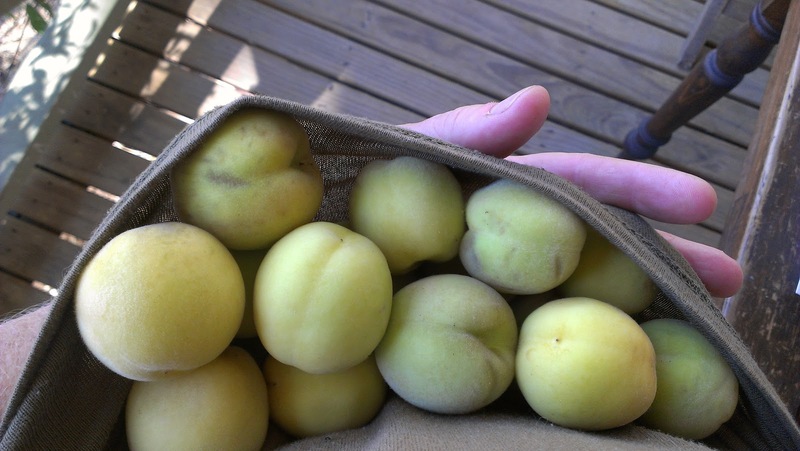 This summer has been a season of peaches. 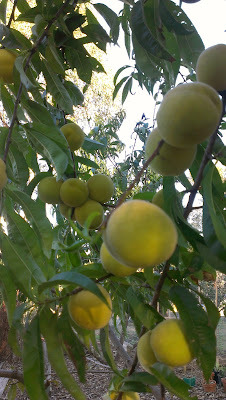 When we moved to our new patch, there were 4 peach trees around the house which had all set fruit. Three of the trees ripened pretty much together even though they were different varieties - some largish, some quite small, some cling stone, some free stone. 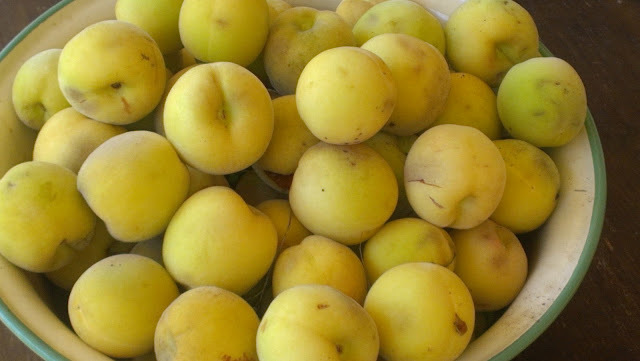 All three trees that have so far offered up their bounty have been yellow skinned and fleshed, some with a prominent blush and some with hardly any, all delicious. They are cling stones with a whitish flesh, they are pretty delicious but a little sharper in taste that the others our patch has yielded. I have checked my fruit growing bible which has a great list of different varieties of most fruits and none listed seem to describe these peaches. 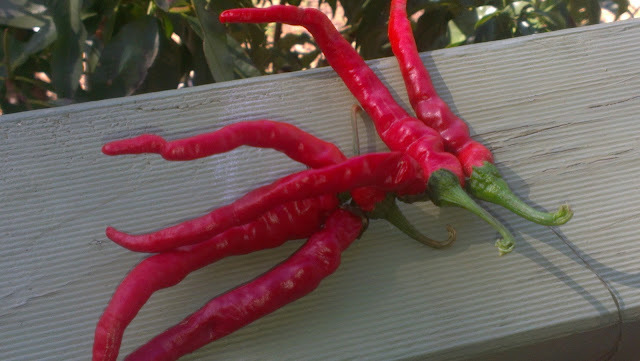 Does anyone out there know what variety these may be? 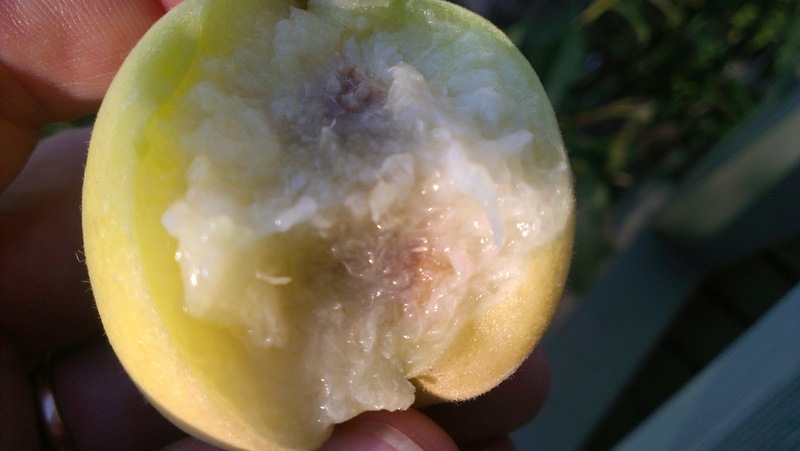 They are very late season and I have noticed that they tend to bruise quite easily. Have you some fruit coming on? What has been the fruit of the season for you? 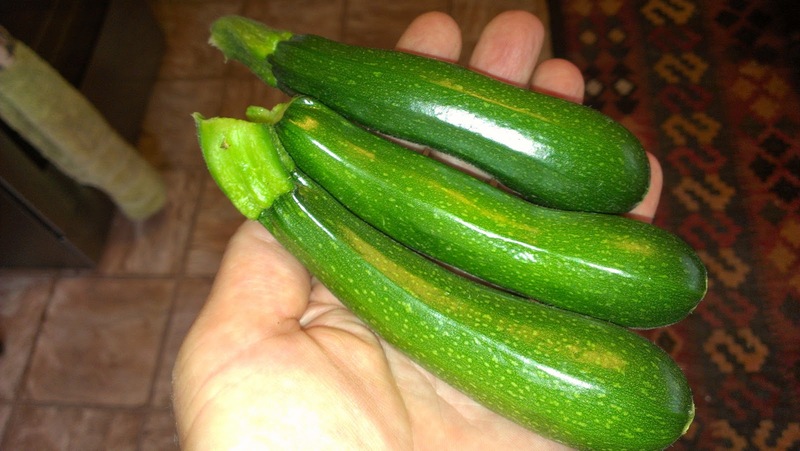 Now I am sure that you will agree with me that 4 zucchini is not a glut, but compared to the productivity to date from my zucchini, 4 feels like inundation. The slightly cooler weather (still in the low 30s) has been kinder on all my plants and the zucchini is finally comfortable enough to set a number of fruit. Armed with 4 small home-grown zukes, I decided to make this side dish. The recipe comes from a Gourmet Traveller but which issue I have no idea, I cut the recipe out. I provide the amounts here I used which are pretty much the same as in the original recipe. It takes no time at all to make. The most time consuming part is slicing the zuke very thinly which I definitely recommend you doing - it's worth it. Indeed 'trifolati' in Italian (apparently) means to slice thinly as you would a truffle. Heat the oil and add garlic, rosemary and anchovy fillets and cook until the anchovy starts to disappear. Add zucchini and oregano and stir until zucchini is just tender. Serve warm or at room temp. It would be beautiful with a white fish or smoked chicken, I had it with some left over cold roast lamb because that's what I had hanging around. 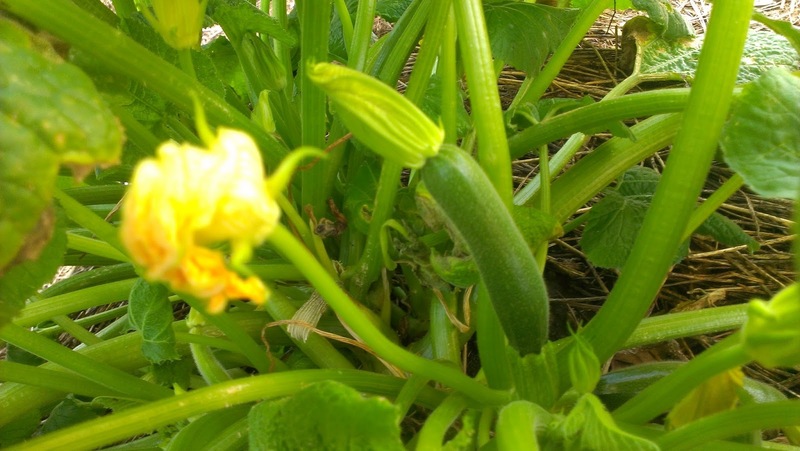 How is your zucchini crop? Still going? Contemplating zucchini preserves yet? Relish or chutney? This week Jen from Digging up the Dirt has made a zucchini burger, I am liking it! With the weather cooling (slightly) and with a little added rain, I have had a little more produce to pick. Delights this week have been the Minnesota Midget Rock melons. 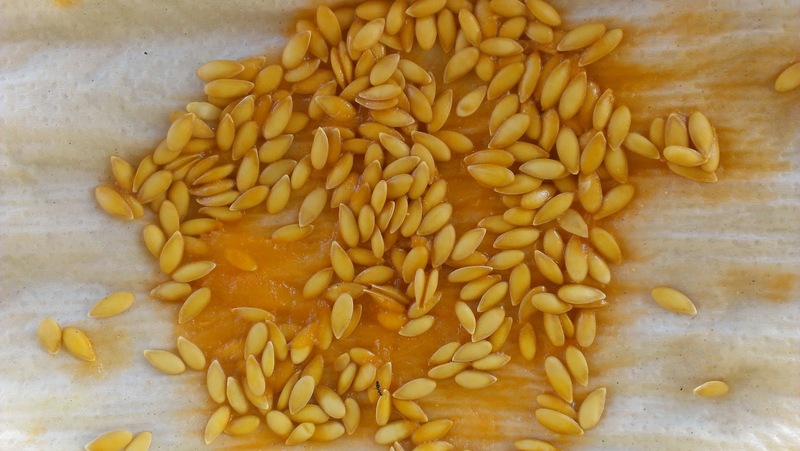 They have been such performers, dealing with the heat and the lack of rain, I have decided to 'harvest' their seeds to re-plant next year. I am also starting to get a decent picking of zucchinis (about time). Here are three that I have picked just the last couple of days, the good news is that more are on the way. Amazingly, the radishes that were almost completely grazed off by the Wallaby have started to produce their rosy little swollen roots. Other than this, my harvests have been mostly rocket, rocket and more rocket. 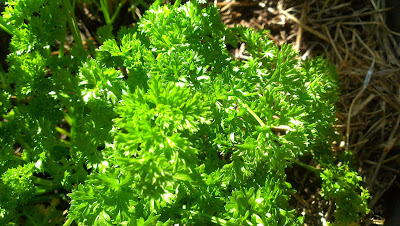 I am not very good at remembering to take photos of the things I harvest, especially when they are herbs and saladings, so you will just have to have pictures of my plants instead, you can see where I have picked the rocket at least! 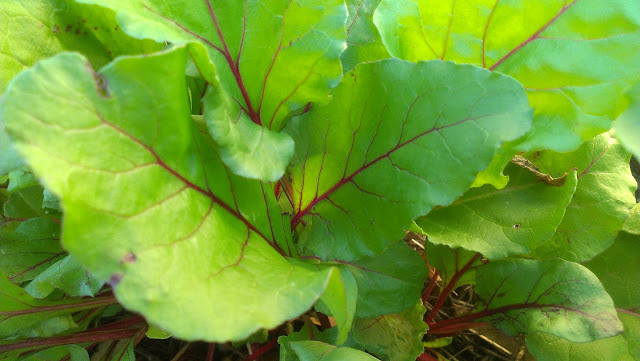 Baby beetroot leaves also for salads. Basil - not huge quantities, just tip pickings for salads and parsley, chives, garlic chives and thyme. I am contributing this to Daphne's Monday Harvest. A collection of great produce will be posted there soon, when the earth turns a little more. 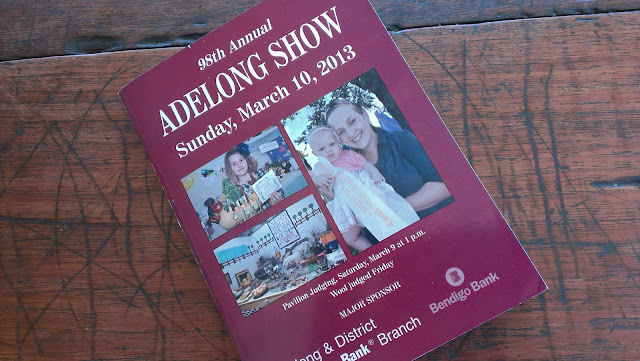 Well the 98th Annual Adelong Show has concluded for the year. The Yanco Agricultural High School Equestrian Float and their highly groomed ponies have headed back up the Sturt, the pampered breed sheep and cattle can now rest in their stalls without having their wool separated and their confirmation critiqued and all can contemplate the competition and the judging, and, if they took out a prize, can stroke their felted ribbons and admire their prize winning cards. 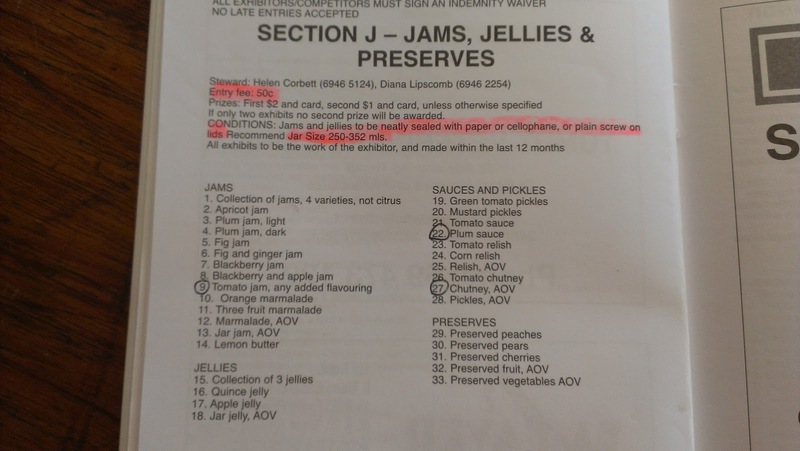 As you will know from a previous post, I decided to try my hand and submit some entries in Section J - Jams, Jellies and Preserves. Here is the display for Section J. 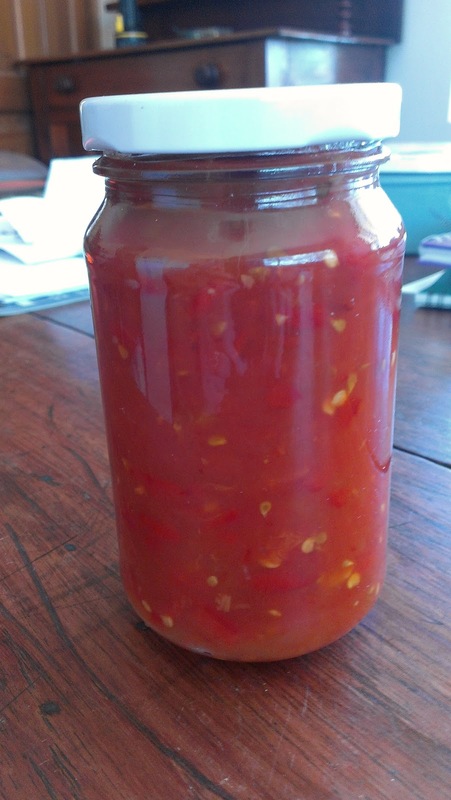 Class 9 - Tomato Jam, any added flavouring with my Tomato Chilli Jam, and, drum roll please.... I took out Second Prize! The winner of the class was Ms Dianne Newland. It appears that there were only two entries in that class but I am consoled by two facts, 1. that the Rules and Regulations of the Pavillion clearly state that "The Judge will not award prizes to exhibits which are not considered to possess sufficient merit" and, 2. that Ms Dianne Newland won just about every other class of Section J AND consequently took out Most Successful Exhibitor in the Section and was awarded a wonderful blue felt ribbon. I feel honoured to come second to such an awarded competitor and prolific jam maker. Class 22 - Plum Sauce. Well the class had more entries that Class 9. There were 4 entries and I did not take out a prize. Instead the winner was Ms Joanne Crowe and in second place was Ms Leone Mears. Congratulations Ladies! Reflecting on my own performance and the look of the winning exhibits, I suspect I should have put my sauce through the blender, cooked my sauce on a bit to get a darker colour and popped it in a bottle with greater pouring ability. My sauce was a chunky one and I think the Stewards were looking for smooth and perhaps dark? Mine is the tall bottle with the yellow lid - pale but interesting as my mother used to say of me. Class 27 - Chutney AOV ( that's chutney Any Other Variety other than tomato, tomato chutney being Class 26). There were only three entries but I am glad to say that I took out second prize. This time the winner was Ms Marlene Pearce. Well done Marlene! 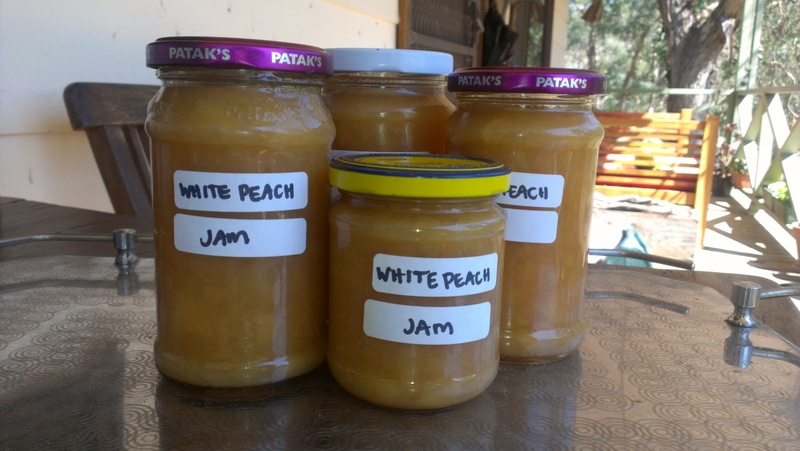 My entry was a Peach Chutney made from my farm-grown peaches, the very peaches I was in competition with the Wallaby for. The recipe was entirely made up from me head and adjusted for my palate. I am pretty chuffed at this one being such an improvised recipe. In total I won $2.00, $1.00 each for each second place. It cost me $1.50 to enter three exhibits. 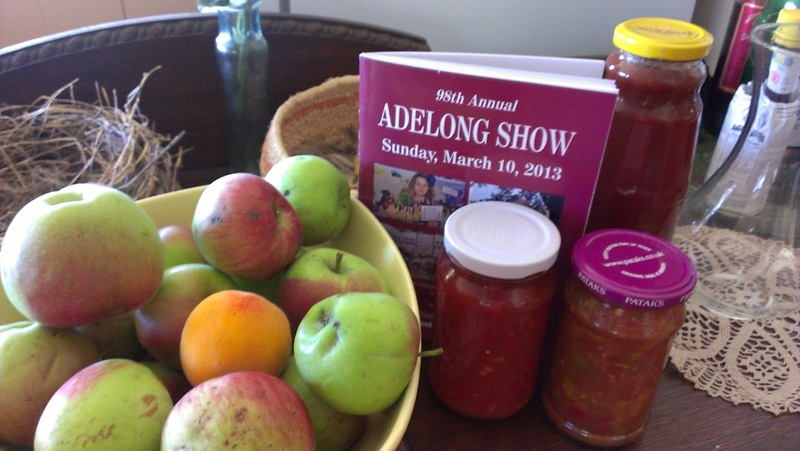 I donated the winnings to the Adelong Pastoral and Agricultural Show. I was pretty pleased and excited at just taking part. I met lots of lovely ladies and saw lots of beautiful produce all of which I am sure tasted much better than anything in the shops and that very often I bet was made from home-grown produce. It feels great to have such simple home-made things valued at shows like these dotted all over the country-side. Well done everyone for making the world a more home-grown and home-made place. That I took out two seconds makes me feel pretty happy, a small but warm achievement and a mark of being part of the community. On collecting my jars, one of the Stewards remembered me and my produce and commented that I had done very well and that I must enter again next year. I will, I promise. On the journey home my prize-winning cards sat on my knee. 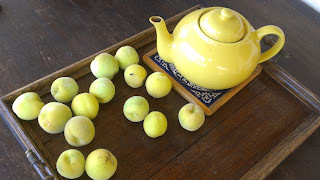 Now at home, here they are along with their produce. On hearing that I had submitted entries, my mum joked with me that I will have to start a trophy wall, I guess I will have to find some way to show my cards... but perhaps not a wall. And The Lad said before the Show that if I won he'd carry my on his shoulders through Adelong. It's just as well I came second! Just as well as the main street of the town is so short. 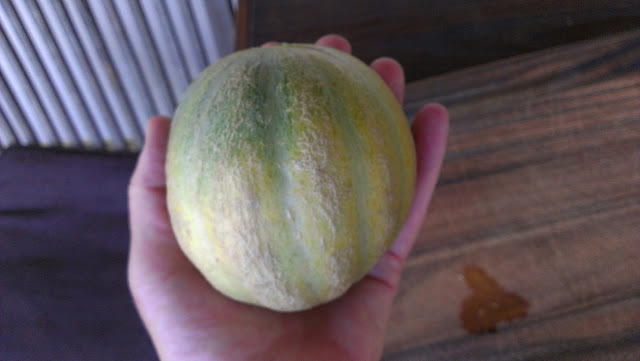 Yesterday my Minnesota Midget melons ripened. In the morning, they looked like they had a good way to go, but in the afternoon they had suddenly turned a yellow colour. 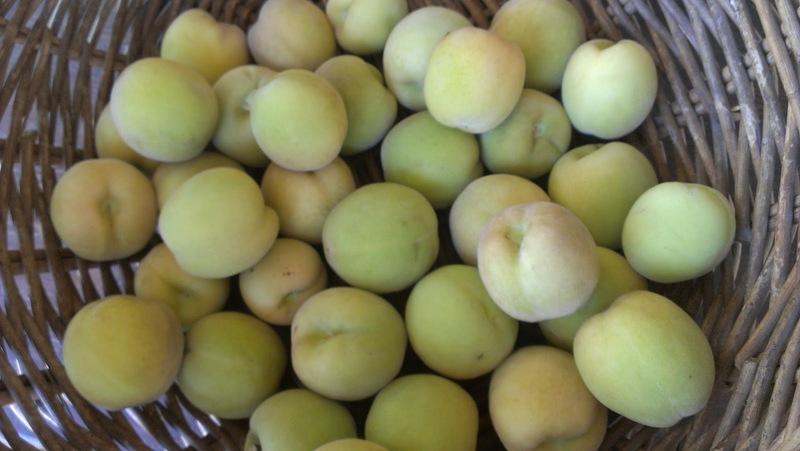 I got down on my hands and knees to see if they smelt ripe - they did - so they were promptly picked and admired. 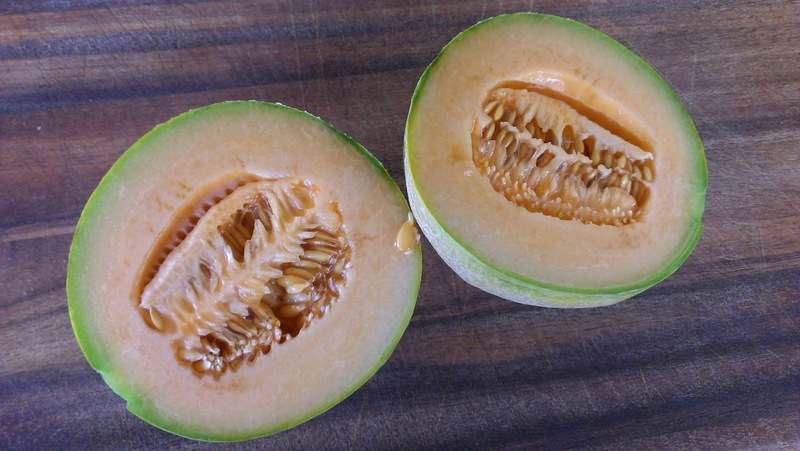 There were only two, but what a lovely pair of melons! They are only small as their variety name implies - just a handful each. 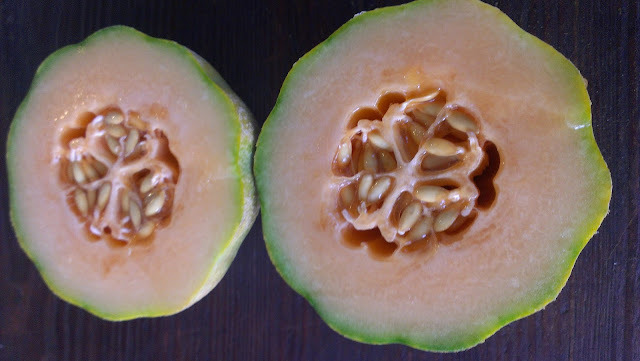 This is fine by me as I am really the only household member that is a rock melon (cantaloupe) fancier. They are really very heavy for their size and very juicy inside. I am really surprised at how juicy they are given that I had to be very careful about how much I watered due to my limited water supply. They have that special fragrance that rock melons have ( that not everyone likes but I love) but a somewhat crisper flesh than shop bought rock melons. 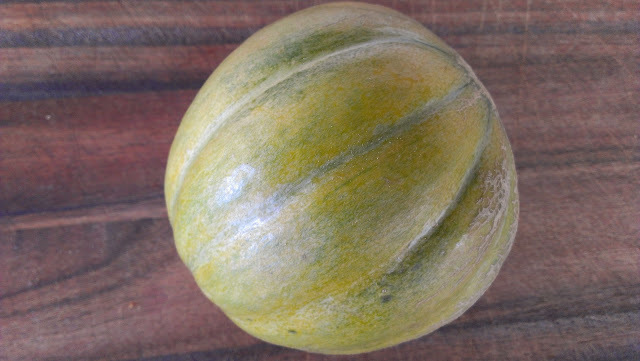 I have posted about this melon previously. 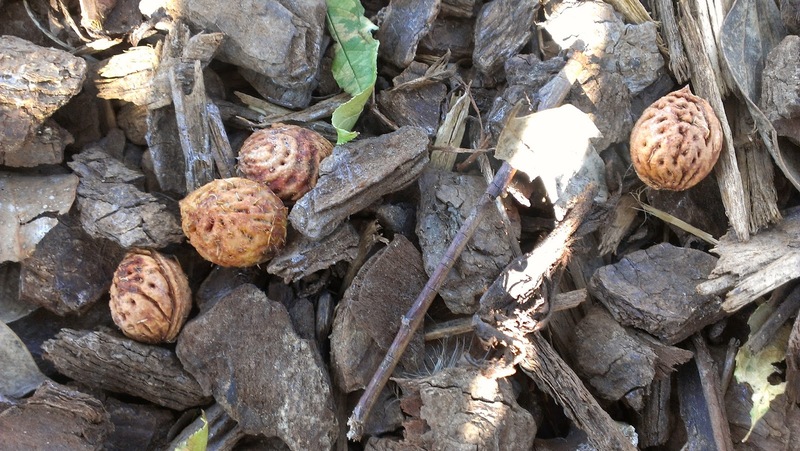 These little blighters have toughed out a really hot and dry summer. 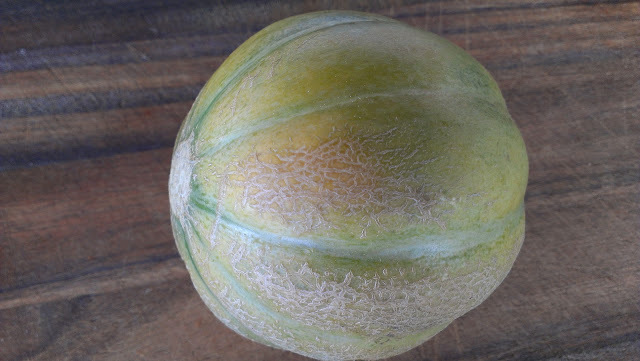 The plant originally set 5 fruit but I guess the plant just decided it could only sustain 2 fruit given the difficult record-breaking hot season. I would certainly grow this little fellow again. It has proved itself in a difficult climate, takes minimal space in the patch and I like the smaller fruit size and the crisper flesh. 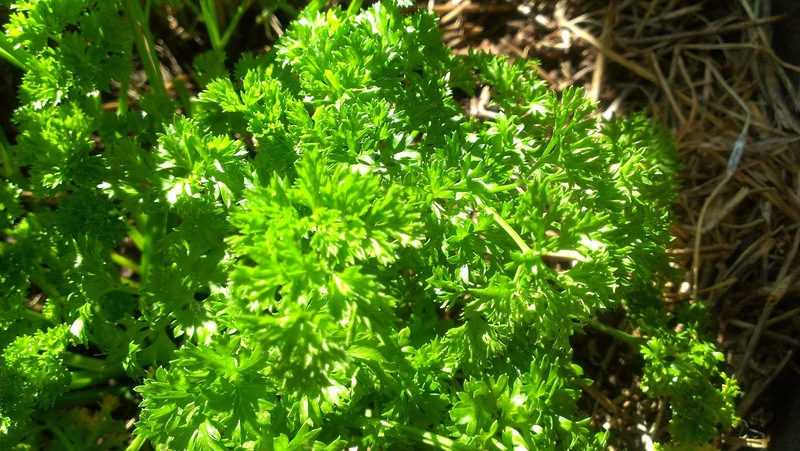 Have you grown something this year for the first time? How did it go? Tonight I decided to love my zucchini raw in a simple salad. I can't claim the recipe as my own, it is adapted from this recipe. 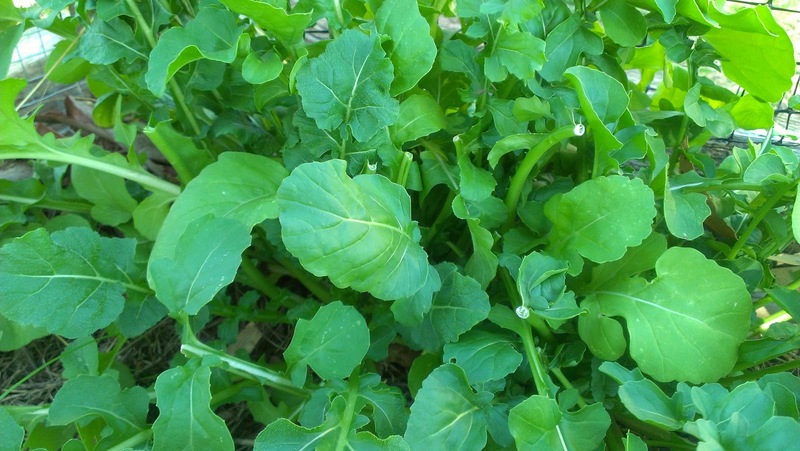 If you like the bitterness of rocket, lemony flavoured zucchini and the saltiness of peccarino then this one works. I really enjoyed it. 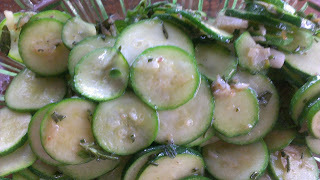 Toss the zucchini in lemon juice, lemon zest, olive oil and black pepper. 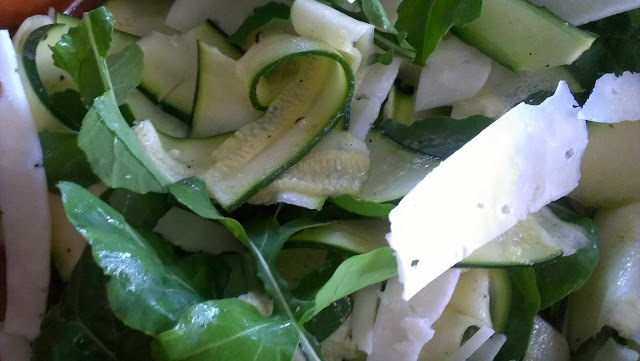 The the zucchini sit in this dressing while you wash and spin the rocket. Place rocket on your serving dish and top with drained zucchini and shaved peccarino. Eat. What's happening with your zucchinis? Contemplating preserves? 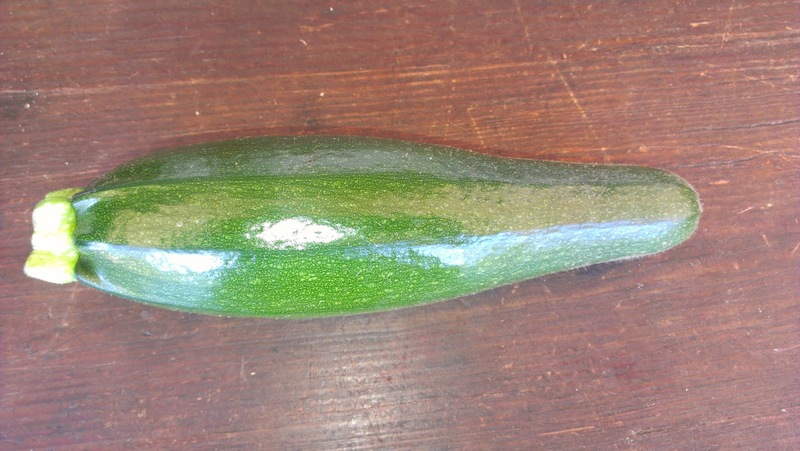 Managed to make the zucchini the favourite vegetable of the household? I suspect that one of the marks of joining a rural community is becoming a volunteer in the Rural Fire Service. Now that I have been vetted and issued my unique volunteer fire fighting number, it's time to take on another marker of joining the community - taking part in the regional agricultural shows, not by merely visiting, but by entering some of my produce. Having viewed some of the competition and exhibit standards at the Gundagai Show, I have decided to enter produce in the 98th Annual Adelong Show. Each entry will set me back $0.50c and prizes are $2.00 for a win and $1.00 for second place. But its not the riches I seek... it's the fame. 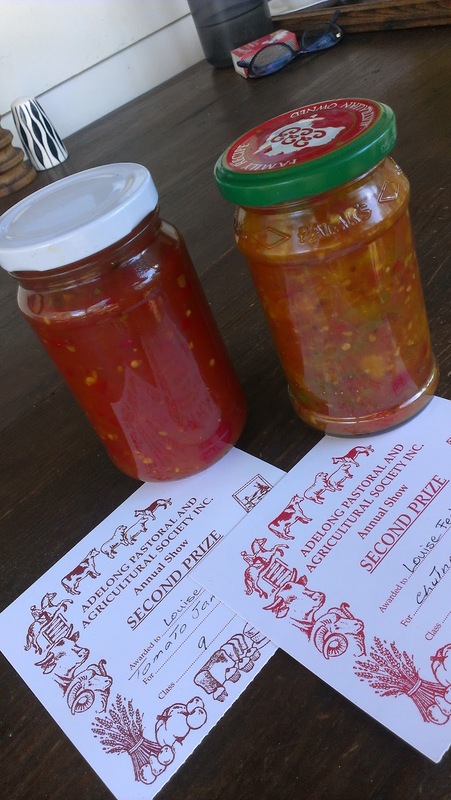 Fancy being known around town as the maker of the winning Tomato Jam! Here are my entries - first, Class 9 - Tomato Jam, any added flavouring. And my entry for Class 22 - Plum Sauce. 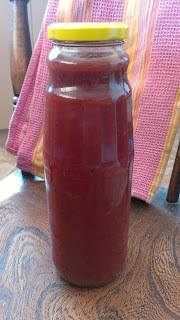 This large tall jar contains a recently made Spicy Plum Sauce. It was made from plums gleaned from the side of the road (but perhaps I should keep this fact quiet, lest gleaning be frowned upon). 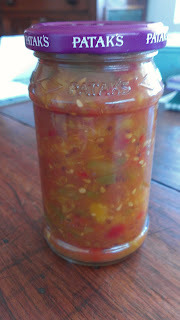 A previous blog post documents the recipe used - largely made up from my own head. Perhaps a fatal mistake? And here is my entry for Class 27 - Chutney, AOV. Being perplexed about the meaning of AOV, I called one of the Stewards. She patiently and clearly communicated that it stood for ANY OTHER VARIETY. I felt a bit stupid! Let's hope she doesn't remember my voice. You see Class 26 is a Tomato Chutney and therefore Class 27 may be a chutney of another type. 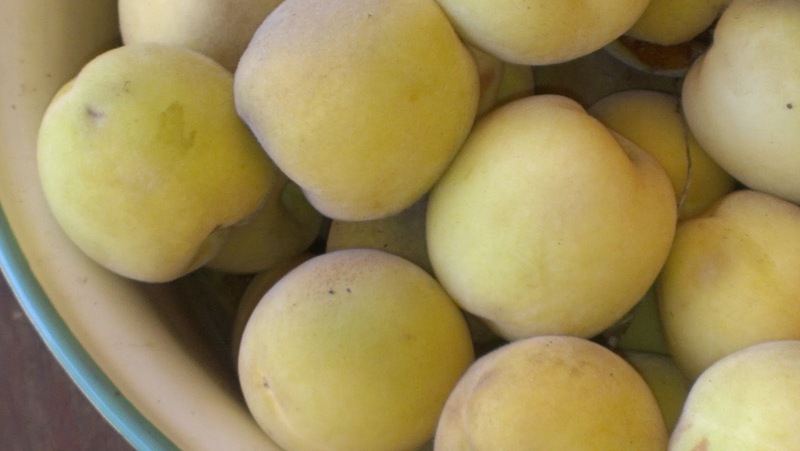 This fact now being clear, I am submitting my recently made Peach Chutney made from home grown peaches also previously posted upon and also made up from my own head. My fear with this preserve is that the ladies might find my fruit a bit chunky.And do the judges like tomato seeds or are these frowned upon? I need your help here .... Unfortunately the jar lids in class 22 and 27 have some commercial writing on them. This is not acceptable according to the Handy Hints for Pavilion Exhibitors. So apparently it is acceptable to present your preserves with a cellophane top. So should I just remove the screw lid and place the cellophane on top? I am not permitted to cover the offending commercial writing with a fancy cloth cap. And I would think that I should add the cellophane film as close to submission as possible don't you? To minimise any potential ill effects of opening the currently sterilised jar in a still warm climate? But then I am nervous about transporting the jars the 20kms to the Adelong Show Ground capped only with a flimsy cellophane film.